One of the many things I like about living in Hong Kong is the variety of activities you can engage it. Because of its sheer size (well, relatively speaking from where I used to live at) and geographical location, this country really has its all – from idyllic mountains to quaint seaside, from packed nightclubs to deserted beaches. Don’t even get me started on the food; I can feel my waistline expanding as I type. So putting one (place) and one (food) together, you have endless permutations on what you could do. 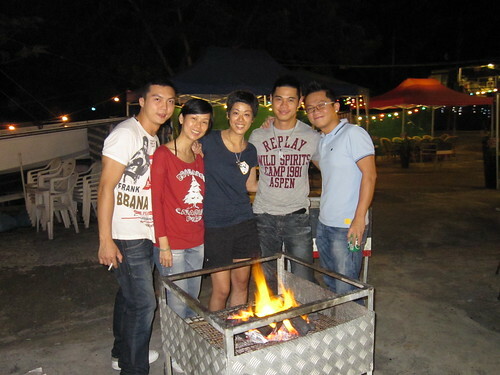 And so my friends and I rolled the dice and did a barbeque dinner at the rural Tai Tam Tuk Village, located at Stanley one Friday night recently. Taim Tak Tuk Village is by far the most outskirt place I ever visited in Hong Kong. Not by real distance per se, but the amount of effort necessary to get there. First, we have to endure a 40-minutes mini bus ride from Causeway Bay to Stanley Plaza. And then from there it was a short but heart-stopping cab ride to the BBQ spot as the driver navigated through dense forest and pitch black pathways. A sense of holiday permeated the air as soon as we alighted from the taxi. The entire place was empty save for the boss of the BBQ restaurant and his Filipino helper. Boats were bobbing up and down in the gentle waves of the reservoir, as a cold night breeze sailed across its surface of the calm water. Houses on stilts dotted the coast, and stars like you never seen in the city night sky dotted the wide expanse of Milky Way. The only sound, apart from us, was the chirruping of crickets and hoots of owls. 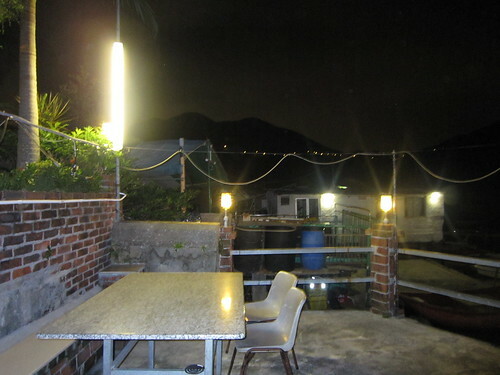 I can hardly believe that we were still in Hong Kong. 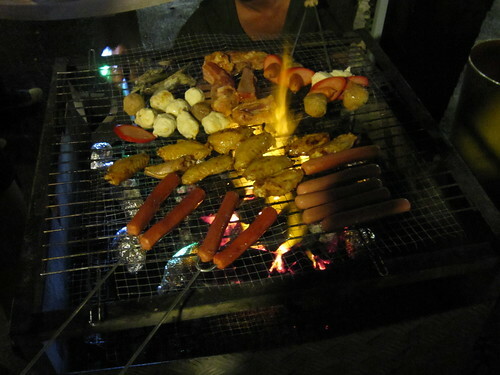 #3 – The highlight of the night; BBQ food! For a mere HK$100-ish, the food was free flow. You don’t even need to mess with the fire; it was set up the restaurant owner. 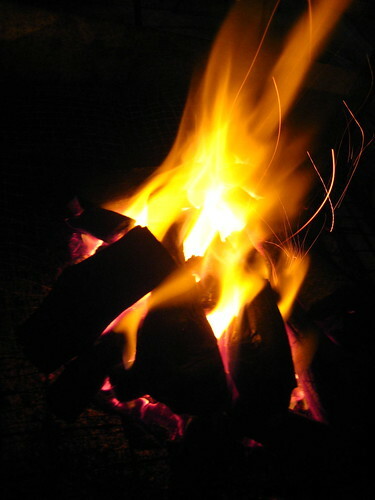 All we need to do was try not to burn too much food and turn our dinner into a variety of charcoal-based dishes. At the end of it my friends were commenting the food was horrendous. I couldn’t have cared less if, and only if, my one major concern was addressed, and that would be…. #4 – BEER!!! Cheap beer, that is. At only HK$8 per can, we guzzled them by the dozen, so there wasn’t one single sober guest in attendance that night. Good time, good time. By the time we were sufficiently bloated from the vast amount of cholestrol consumed and alcohol inhaled, it was time to chill out, relax and…. … have a game of mahjong! I couldn’t believe my eyes when they started to set up the table with those weird looking Chinese tiles (for the life of me I am still clueless about mahjong). I was told there were board games and cards too, whatever strike my fancy. Do you have Happy Family, I asked. You guys are already one, came the cheerful answer. The place was also pet-friendly and as such was a blessing to us. Eden the friendly golden retriever (I know, right!) joined us for the night; delighted when we played fetch with him and contended just sitting by us while money was won and lost over mahjong table. Granted, pets can hardly eat the food available so you gotta come prepared with whatever suitable diet for your beloved mongrels. All in all it was a great night out. Even though the food was crap, the company and laughter and music and (of course) beer more than made up for it! Used to play mahjong a long while back :) Forgotten the half of it unfortunately! @ Paul – Probably it’s a good thing. Those clattering tiles can be addictive, I heard. Pong! Pong! Pong! Looks good, I’ll never forget Mahjong though..